After kicking-off the smartspeaker trend with its own Echo series of Alexa-enabled audio gear, Amazon has handed over the reins to its voice-controlled helper to third parties. At IFA 2017 that means Alexa-enabled speakers are ten-a-penny. 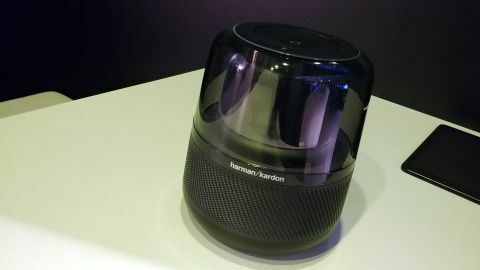 But Harman Kardon’s take on an Alexa device tries to do things a little differently, standing aside from the pack with a bold design. A barrel-shaped speaker standing about a foot tall, it has a gun-metal grey base where its speaker grille wraps around, while up top is a clear plastic section that also houses the light array that glows when Amazon’s assistant is activated and listening for commands. The design seems to be splitting opinion, but it looks much better in the flesh and in action, when the lights kick in for a sci-fi sheen. And what it certainly does is separate the Harman Kardon Allure from the pack of other Alexa-enabled devices. You get the feeling that, compared to other Alexa speakers, designed to sit in the background discretely listening away, the Allure is instead meant to be a centrepiece. And that’s definitely reflected in how loud it gets. With a built-in subwoofer, it can not only reach deafening volume levels, but also has a crisp, clear sound that’s much improved over Amazon’s own Echo, and leagues ahead of the miniature Echo Dot. If you want a speaker with some smarts that actually sounds good too, the 360-sound from the Allure is very tempting. And despite the potentially high volume levels, its 4 mics do a great job of picking up voices. Noise cancellation tech lets a voice be heard over the din of a room, and Alexa is now smart enough to discern even the strong accent of the Harman Kardon employee who walked us through our time with the Allure. And it’s that underlying Amazon Alexa tech that still impresses too. Just like an Echo, the Allure has access to tens of thousands of voice-controlled ‘Skills’, controlling everything from smart lighting to music streaming, thermostats to news briefings. We’ll have more on the Harmon Kardon Allure soon, with the Alexa speaker launching in ‘Winter 2017’ for an expected retail price of $249.95.